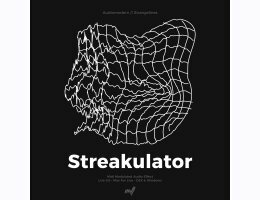 Audiomodern & StrangeLines present Streakulator V2, created by developer Ernesto Cecco D’Ortona, Streakulator is a midi-modulated audio effect suitable for modern producers to use in the daily workflow, but it’s suitable for many uses, mostly sound design. Its main job is to create crazy sounds with a human touch in no time: possibilities are endless. Streakulator is the ideal audio fx for Ableton Live to mangle any sounds source beyond recognition with ease, delivering outstandingly unique output: you can do sidechain, sound design, waveshaping, filtering, wobble and growl basses, synth sounds from literally any source, heavy metallic effects, robotic/futuristic sounds, perfectly synced gating, dramatically fast sound shifting with presets automation and it goes as far as your imagination can go.